Find JCPenney Coupons & Online Promo Codes. Check the latest JCPenney Coupon offers and save money when you use printable coupons and online promo codes to buy clothes, appliances, home decor, shoes, jewelry, and more. Check for JCPenney coupons online: they usually have a bundle of them valid for both online purchases and in-store. Check for special coupon giveaways, such as $10 off a purchase of $10 or more, usually valid in stores only for a limited time and available while supplies last. Look for percents off coupons in the mail and free shipping coupons online. 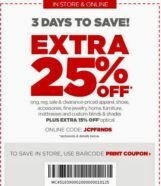 Sign up with JCPenney and they will send you a 25% off coupon directly to your mobile phone or email. Become a cardholder to receive special coupons, such as 20% off home items and mattresses or 15% off select items with no minimum purchase required, usually for in-store and online use. Use JCP coupons strategically to save the most money, meaning if you have more than one coupon use the one that provides best value as JCPenney does not allow stocking coupons.